The 1970 Plymouth Cuda was a completely redesigned car from previous models. The vehicle was essentially the same length but was now 5 inches wider. The increased width allowed for more powertrain options (including the 426 Hemi). The sheet metal and styling all were designed to reflect a "clean" and uncluttered appearance. Plymouth succeeded in this area and created a truly memorable and respected car in the new Cuda. The exterior of the car features smooth features, such as flush mounted door handles, and fenders and quarter panels that seem to mate into the grill and tail panel. The grill featured two large rectangular inlets, single headlamps and optional electrometric (urethane coated) bumpers that allowed bumpers to be body color. The new Cuda had a distinctive pony car appearance now with a long hood and short deck lid. All Cuda's came with dual hood scoops (optional Shaker), hood pins, dual driving lights, and Cuda badging on the rear tail panel. The interior of the Cuda was all new; high back buckets, sports car inspired steering wheel, large gauges, smooth edges, and deeply sculpted door panels were all part of the new look. And, of course, if you ordered the A833 4 speed you received the famous Hurst pistol grip shifter. 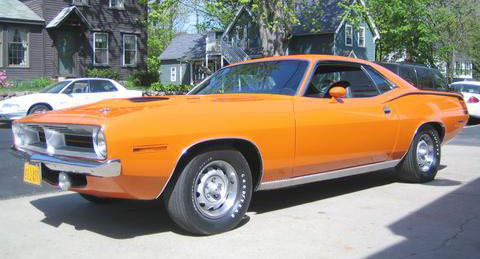 The 1970 Plymouth Cuda was available with extensive performance options such as Ralleye wheels, Hurst pistol grip shifter, rear window louvers, rear spoiler, fog lamps, hood scoops, shaker scoop, hockey stick striping on the quarter panels, and high impact exterior colors (TorRed, In Violet, Lemon Twist, Lime Light, Vitamin C). Under the hood the Cuda was a whole new animal compared to previous years. Base motor options was a hi performance 383 cid (335hp). However, the 340, 440, 440 six pack, and 426 Hemi were all available for those buyers who were willing. For those who ordered the hemi or six pack, the indestructible Dana 60 reared was standard. These are possibly the most valuable and sought after Mopar muscle cars. AAR Cuda: Designed to resemble a SCCA Trans-Am race car this was a racing inspired Cuda. Included high revving 340 with six pack setup, special suspension with high ratio steering, rear spoiler, huge hood scoop, front valence, disc brakes, side exit exhaust, and special paint (flat black hood and fender tops & huge stripe down length of body. Note: 652 Hemi Cuda coupes and 14 Hemi Cuda convertibles were produced in 1970.